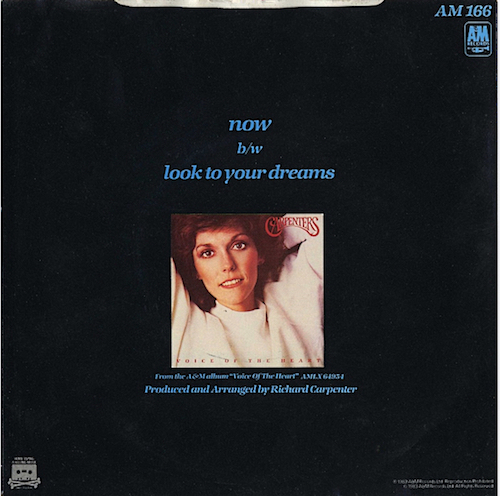 Discussion in 'A Song For You: The Carpenters Forum' started by Sue, Feb 10, 2019. Exactly the way I felt and still feel about it. You summed it up so well, Murray. no1kandrfan, Sue, Murray and 1 other person like this. I think those who are looking for weakness in Karen’s vocals are going to find it. I also believe that most who ‘hear’ these supposed flaws know that it was Karen’s swansong. Knowing that fact generates such a reaction. Of course, she wasn’t even remotely ill in 1972. But people see and hear what they want to see and hear. I, for one, think Karen sounds amazing and much less tentative on ‘Now’ than she does on MIA. I also think she sounds just like the Karen of the early ‘70s on ‘You’re Enough’, which, as we all know, was also recorded in April, 1982. Nick, Nawvish74, CarpentersToYou and 4 others like this. The beauty of "Now" is that Karen DID sound a bit tired, mature, wise. But no one can deny how gorgeous her voice still was; especially the incredible, powerful "surprise" last line. To my ears, the choir was appropriate because it suggested heavenly angels. Greg, no1kandrfan, John Adam and 3 others like this. “Now” should’ve been left in the vaults. It is very weak, and I don’t think it was because she was ill, since Karen also recorded “You’re Enough” during the same session (along with 2 other songs), so she was very clearly in good vocal health. And “You’re Enough” is clearly the superior of the two 1982 released recordings. Most of the time when I listen to VOTH or “From The Top/The Essential Collection”, I usually jump to the next track. I don't have the UK 7" but found these on the net. Thought it would be nice to show the picture sleeve and how this single was presented in the UK. I didn't know that it was also released in Brazil as a single 7" with a quite different sleeve. Why does the labels for the Brazil 7" say Stereo~Mono? no1kandrfan, newvillefan, Sue and 2 others like this. I noticed that the Brazil single is 33 1/3 RPM. Could there have been TWO tracks on each side, one stereo and the other mono? I once took a music appreciation course in university. The professor, a gifted concert pianist, remarked that music (or any art for that matter) succeeds when it elicits an emotional response in the listener. That's why music is so subjective, as each of us hears it (and interprets the lyrics) through the filter of our own life experiences. One person will listen to a certain song and experience great joy, another will feel profound sadness, while yet another doesn't feel much at all. One person will dissect the song into its elements, and dismiss it based on it's perceived flaws, another is willing to overlook those imperfections, and appreciate the work as a whole, and yet another person thinks the song is perfect as is, and wouldn't change a thing if they could. All I can say is, thank goodness that we aren't all the same, or this world (and this forum) would be an incredibly boring place! Yes, I can hear that Karen's voice had weakened, but it was still beyond beautiful (in her fragile condition, that she could even stand up without passing out, let alone sing, was no small accomplishment). The arrangement, and especially the choir, ensured that it never would have been a chart hit. It was originally written for a cheesy TV detective show... I don't care about any of that. As a whole, it just works for me, and works well! ... as for "Now" being elevator music?... okay, I'll concede that... but ONLY if it were played in a solid gold elevator, that went all the way up to the pearly gates, baby! Sue and Murray like this. It has also always felt me to like a message from Karen from beyond to us - I mean the fact that it was her last recorded song and the first new song most fans heard after her passing, and the fact she sounded different yet sublime . Sue, Murray and Jarred like this. John Adam, no1kandrfan, Kacfan and 2 others like this. While she does sound okay, for the first time, Karen actually sounds weak on a song. There are parts of the tune she really should have punched. Coming out of the sax solo and the chorale, she should really have punched the vocal but she couldn’t. As a result, it’s unconvincing. Her illness had finally caught up with her and you could hear it in both her lack of power and her altered tone. I really enjoyed your assessment of the song Ed. I agree, her voice does sound different on this track. Right up to 1980, she still had that rich, warm tone to her voice (think The Uninvited Guest), whereas just two years later, her tone is thin and reedy. From the opening note to the last line she sings, there's quite a range there and whilst technically she hits all the notes, the timbre - especially in the lower register - is not the same as before. They weren’t making any concessions to get on the radio at this point. This tune was never going to be a hit whether she lived or not. This is not what was happening in 1983. They’d become completely insular and this was the result. Not a great way to go out. I voted yay for the song, because it's a pretty tune and symbolic as it's Karen's last recording, but I agree with you. It would seem that by 1982, Richard was either deaf to the changing musical trends of the time, or resolutely refused to adapt, thus effectively also holding Karen back as an artist. I know he never thought of them as a trendy act, but to be recording tracks like this in 1982, they never stood a chance on radio. John Adam, ThaFunkyFakeTation and CARPENTERS-COLLECTOR like this. Because We Are In Love. But, compare those two songs, in their highs and lows. It is incredible to my ears that the weakness in Karen's vocal is not readily perceived by everyone. ThaFunkyFakeTation and newvillefan like this. The only thing that disturbs me is that she spent a year or better trying to break the mold of elevator status to come back from therapy jumping back in to what she wanted to transition from. The song is elevator music to begin with, but her voice gives it a magic touch even though it not at its best. But thstbsong dong can only be elevated so far and she took it to its best, yet the chorale pulls it back down. Richard has expressed frustrations over their perception yet this song plays right to the reason. As fans, we like it, but as those on the outside it’s back to the 1940’s. Richard gets a lot of the blame for being terminally uncool and for "holding Karen back". Heck, I've done it myself but how much of that blame does Karen deserve? I mean she did sing the songs. She could have resisted, right? Just thinking out loud. I voted "yay" even thought it is obvious Karen's voice is not at its best. There is an element of "sweetness" in her delivery that gets to me. To me 'Now' is one of Karen's most gorgeous moments as a singer. There is something so intimate and fragile in her performance which underlines the bitersweet irony of the song - as Karen never found that one love she craved and she was still very much locked in her own personal battles right up until the end. Her tone is almost one of disappointment and the sweetest resignation - it's hard to pinpoint. It reminds me of Billie Holiday's last work on 'Lady in Satin' when her voice was far from its peak, but in the vocal changes there was a startling truth - and one much more affecting and communicative than any vocal perfection. Kacfan and Carpe diem like this. "It was not until after the last newsletter was published that Richard decided to release Beechwood 4-5789 on Karen's birthday, so we hope you're catching it on your airwaves, and expect to see some chart action soon". CraigGA and CarpentersToYou like this. This should probably be its own thread so I don't derail this one any further. My bad. I think the "even partnership" discussion is relevant in connection to "Now" because it is such a step back from her feeling of liberation recording the solo stuff. Maybe she didn't hate Now and these outdated songs but I have no doubt it's not what she really wanted to be singing either. She sounds defeated on Now and You're Enough (both tracks are well below her gifts and a far cry from the sumptuousness of say the Tan Album) - the profound melancholy of her voice from the 70s heydays has turned a darker corner than ever before. I know the whole solo debate gets heated here, but in personal and historical context it's completely relevant in relation to these post 1979 recordings; as Itchy(?) said, she never fully trusted Richard after what he said and did regarding her agency as a person and as an artist. And these 1982 recordings were after both that and her miserable love life/marriage, so those two traumatic events certainly color one's perception of her mindset at this time. I’m inclined to agree here. Now, as discussed, utilised Karen’s higher register which we weren’t as used to hearing, and I think given what we know about her health at the time, it’s easy to label ‘different’ as weaker or not so good. Obviously, it’s each to their own though, and I mean no offence to anyone who disagrees. For me personally, Now holds a special place in my heart for many reasons. 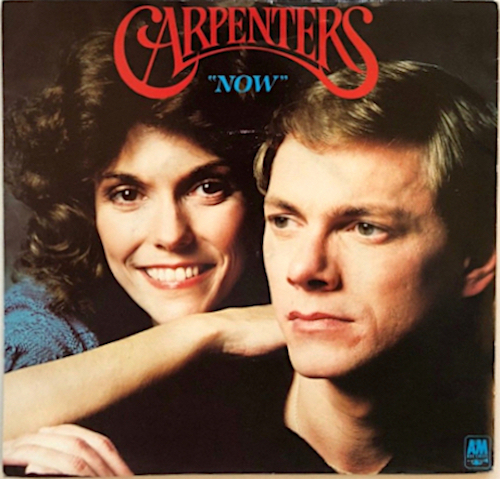 I wouldn’t say it’s my favourite Carpenters’ track, but I’ve given it a yay because I feel it’s very poignant and a beautiful gift, given that at the time it was released nobody really expected to hear any new songs from Karen. Again, this isn’t about higher notes - at least it isn’t for me. This is about a weak voice. Her voice is weaker than usual here. It touches notes and evaporates by and large. Her tone is also largely absent the way we knew it previously. She doesn’t sound awful by any means; just not the same. That’s my issue. To my ears, Karen sounds great- she's just singing in a higher key than on the hits that made them famous. Seems like on this song and Made in America, it was a direction Richard was taking her. Which I never understood because he leveraged that as something that worked against Karen on her solo album. Thank you! That’s another thing which has always annoyed me about the song, as beautiful as it is. It’s in too high a key most of the time. ThaFunkyFakeTation and Mark-T like this.